My eye was caught by the charming bow tie and I wonder whether this has some significance or is merely decorative? As an aside, thank you for researching out these civil arms. I much appreciate your efforts. It took me a moment to work out what you meant. I think the decorative bow merely ties together the two sprigs around Tarragona's arms. The City of Tarragona's arms are beautiful! As for the logo of Escaldes Engordanay (sp? ), judging it only on it's own merits as a logo and not as "arms" I rather like it! First, apologies to the Spanish speakers among you who will have spotted the accent over the a instead of the n in España. Today (Wednesday) the Vuelta starts from Benicassim, a town through which it passed last year and whose name I correctly guessed was Arabic. According to WikI the name is derived from the Banu Qasim tribe, a segment of the Kutama Berbers that settled the area during the 8th century Moorish conquest of Spain. The arms feature not only the almost ubiquitous Aragonese pallets but also the Moorish star and crescent. As to the "Azure a Bend between two Eagles displayed Argent", I can only guess (as I did last year) that they were the arms of a noble who once held the land here. Spanish blazon: Escudo cuadrilongo de punta redonda. De azur, sobre rocas de plata, un castillo de oro, mazonado de sable y aclarado de gules, de cuya torre del homenaje sobresale una bandera de plata con el asta del mismo metal. Al timbre, corona real abierta. The finishing line is in the coastal village of Alcossebre, which forms part of Alcala de Xivert whose arms feature ... wait for it ... a castle (though this time on flat ground). The castle is depicted ""de su color" (proper), though I doubt that the local castle is brown. Spanish blazon: En campo de azur una estrella de plata de ocho puntas y un cáliz de oro con hostia de plata flanqueando un castillo de su color con una torre, aclarado de sable y aterrazado de color natural; surmontando las figuras, sendas cruces de Montesa (griegas de gules) mal ordenadas. Por timbre, una corona real abierta. 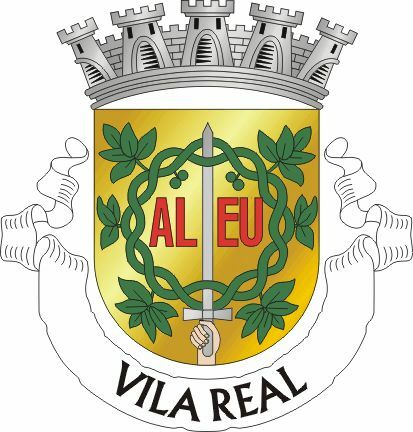 Thursday's stage sees the riders set off from Vila-Real, a royal city as its name implies, founded in 1264 by King James I of Aragon (Jaime el Conquistador). The arms are of course those of Aragon, but on the lozenge that was commonly used in Aragon to distinguish that the arms were those of a city, not a person. 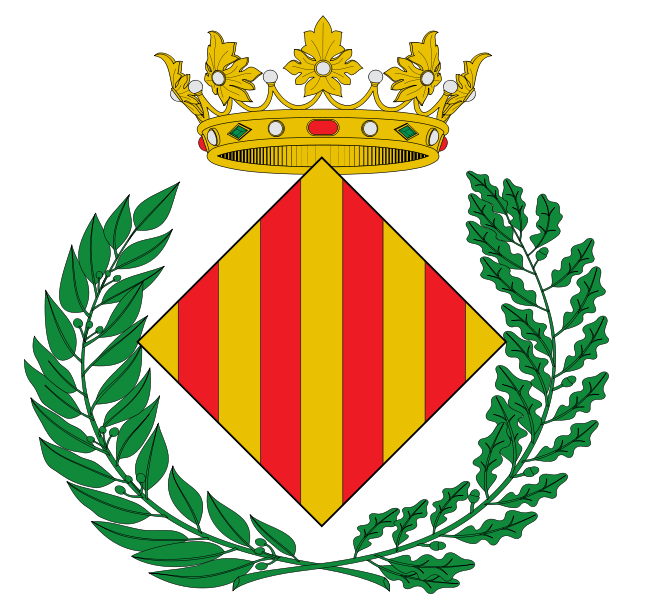 The finishing line is at Sagunto (Sagunt in Catalan), whose arms, adopted as recently as 1998, are those of Vila-Real but with a variety of additions encircling the lozenge. How heraldic these are, or simply add-ons agreed by the town council I cannot say. The M and L clearly have some significance, but I cannot (yet) discover what. Spanish blazon: Escut caironat. D'or, quatre pals de gules. Fora de l'escut a l'extrem, sobre els dos costats superiors de l'escut, cinc estrelles d'argent de sis puntes. A destra i sinistra dels costats inferiors, una M i una L d'or respectivament. Davall de l'escut, una flor de lis d'atzur. Per timbre, una corona reial oberta. The city was originally named Arse (really!) by the Phoenicians, Saguntum by the Romans and Morvedre by the Moors. It has been besieged by, among others, Hannibal and El Cid. It was the birth place of the composer Joaquin Rodrigo (Concierto do Aranjuez). Friday's stage is from Lliria to Cuenca. Spanish blazon: Escudo cuadrilongo de punta redonda. En campo de azur un castillo de tres torres de oro, mazonado de sable y aclarado de gules. En jefe y sobre la torre principal, un lirio con tres flores de su color. Al todo, cuatro torres de oro unidas por un muro del mismo metal. Por timbre, corona real abierta. The description of the flowers: a lily (lirio) with three flowers proper (which incidentally are canting) seems not to match the emblazonment. To me that implies three flowers on one stem, not three lilies as depicted. Spanish blazon: En campo de gules, un copón, de oro, surmontado de una estrella, de plata, de ocho puntas. Spanish blazon: De sinople, el castillo, de oro, almenado y mazonado de sable, aclarado de gules, sostenido por dos leones (afrontados), de oro, y saliendo de su homenaje, un brazo armado, de plata, empuñando una espada y surmontado de una corona real, abierta, de oro, y rodeado de siete luceros, cuatro a la diestra y tres a siniestra, de plata. Al timbre, corona real cerrada. The finish is in the hills north of Alicante whose arms are replete with no less than four letters of the alphabet: A L L A, which apparently stand for Akra Leuka (the Greek name) Lucentum (the Roman name) and Alicante. Note that the rock has the image of a human face which is because Monte Benecantil on which Alicante castle (el castillo de Santa Bárbara) stands is in the shape of a human face when seen from the sea. Spanish blazon: En campo de gules, sobre ondas de azur y plata, una peña de rostro humano, sumada de un castillo de oro, almenado, mazonado y aclarado de gules, sumado a su vez de un losange, de oro, con cuatro palos de gules, y acompañado a la diestra por las letras A y L (Acra Leuka), y a la siniestra L y A (Lucentum Alicante) de oro y puestas en palo. Rodea al escudo el toisón de oro. I have not (yet) discovered the reason for the Order of the Golden Fleece. Chris Green wrote: The finish is in the hills north of Alicante ,,, I have not (yet) discovered the reason for the Order of the Golden Fleece. All I've been able to find looking at a number of Spanish-language sites, including that of the city itself, is that Charles V decided in 1528 that the collar of the Order of the Golden Fleece would be incorporated into the arms in recognition of Alicante's support for the crown. Sunday's stage sees the riders heading north from Orihuela to Benitachell/El Poble Nou de Benitatxell. The race passes through many tourist areas, including Alicante (whose arms we have already seen), Benidorm and Calp whose arms were both discussed in 2016 http://amateurheralds.com/forum/viewtopic.php?f=12&t=1160. Spanish blazon: Partido y medio cortado. Al primer cuartel, de oro, cuatro palos de gules; al todo abrazado de azur sembrado de flores de lis de oro y brisado con lambel de gules. Al segundo, de gules, seis casas de plata, aclaradas de sable, puestas en dos fajas de tres y tres. Al tercer, de oro, cinco estrellas de ocho puntas de azur. Al timbre, corona real abierta. The area was reconquered from the Moors in 1244, so Charles of Anjou may have had a hand in that. The huts and the stars are a mystery - perhaps the arms of a former landowner? I am guessing here, but, as 'poble' seems to have the meanings 'people', 'population', 'village', it is possible that the two rows of houses represents the town while the stars in saltire may well be those of a former lord.